People in many parts of the world shudder to think of the severity of winters in St. Paul, but those who live here know that great fun can be had in spite of the ice and snow and cold St. Paul is home to the most wonderful Winter Carnival around. It is one of the oldest winter celebrations in the country. The first carnival was held in 1886 and it has added excitement and joy to the city ever since. One of the most anticipated events of the Winter Carnival is a Treasure Hunt in conjunction with the Pioneer Press newspaper. The clues are printed in the newspaper, one clue printed on each of the twelve days of the Carnival. The cleverly written clues lead the dedicated treasure hunters to a medallion that is truly valuable. Each clue is successively more specific than the one before, and the twelfth clue gives them the exact location. The treasure is always found in one of the many lovely parks within Ramsey County. For many families, the search for the medallion is an annual tradition that combines great fun and the possibility of treasure. The finders of the medallion are awarded up to $10,000.00 and get a place of honor riding in the closing Torch Light Parade. 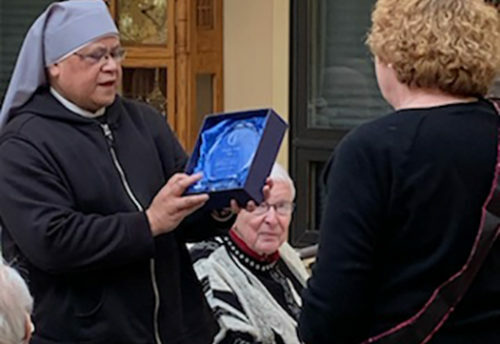 At the Little Sisters Holy Family Residence we hold our own treasure hunt very similar to the Winter Carnival, with the treasure being hidden within the much warmer confines of the Home! A new clue is posted every night by the elevator on the first floor. Many Residents reviewed the clues and were searching very seriously for our medallion. The hunt within the Home was every bit as serious as that taking place out in the frosty air. Our hunt this year had seven clues for our Residents. Our prize was $5.00 or $10.00 if they subscribed to the Pioneer Press paper. 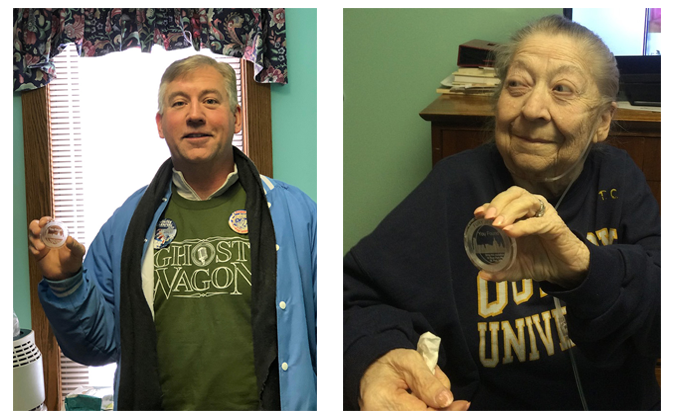 This year, the winner of our Medallion hunt was Resident Pat Ehrman, who found the medallion hiding in the Foyer St. Jeanne Jugan. 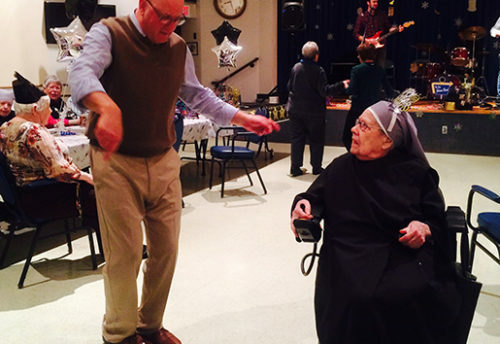 We’re sure that our foundress must have enjoyed the treasure hunt as well. The two treasure hunts are more closely related this year than ever before! 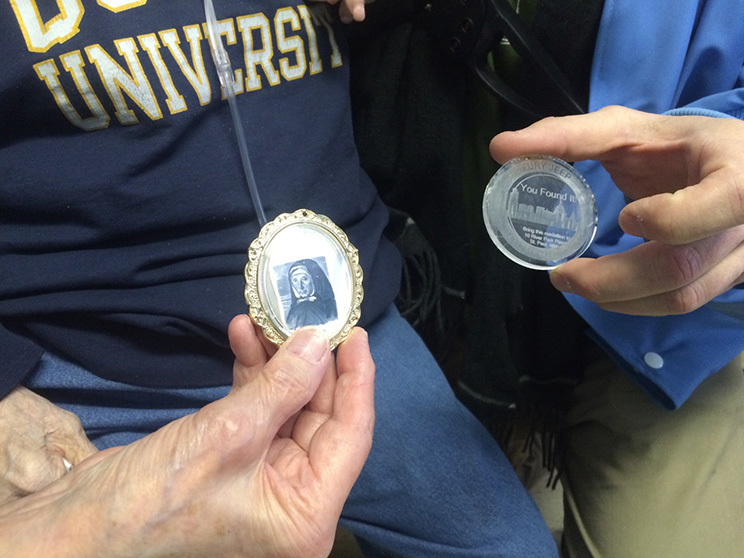 A Resident’s son, John Collins, actually found the St. Paul Winter Carnival Medallion. John and his family found the medallion at 11:30 p.m. on one of the coldest nights the city has seen, the temp dropping to close to -25 degrees Fahrenheit and a windchill that dropped far below even that bitter number. Being the kind soul that he is, John notified the newspaper right away and they sent out a text message to the hundreds of other hunters that it was found so that they could stop and get out of the cold. 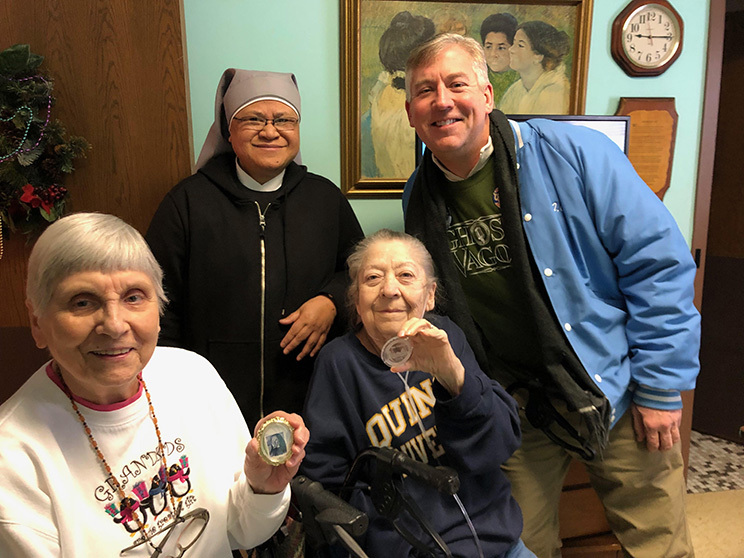 He brought the Medallion to show his Mother Toni Collins and share the excitement with her and everyone here at the Little Sisters. His family, including his Mom, have been dedicated Medallion seekers for forty five years! Their persistence finally paid off, but don’t think they won’t be out there again next year! Below you will find the Clues and Explanations we posted for our Residents. Table and chairs are plentiful in this location—-but the treasure is not there. 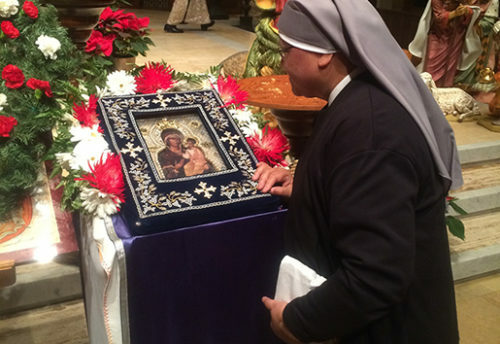 Look around and the treasure you will surely find. Keep it in hand. There are lots of tables and chairs in the Foyer, but it is not directly on the tables and chairs. Keep it in hand means by the sink and hand towels.